The Nintendo Switch has somewhat inconspicuously been giving the classic adventure genre some new life, and this is great for me because these point-and-click adventure titles hold a special place in my heart. 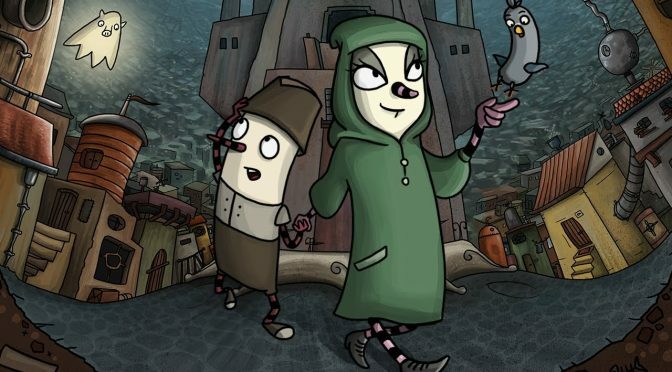 From developer Studio Fizben and published by Headup Games, The Inner World takes the classic point-and-click template and modernizes it for console users. I can honestly say this one had me pleasantly surprised, much like another game I reviewed earlier this year with The Adventures of Bertram Fiddle: Episode 1 – A Dreadly Business. The Inner World in many ways is a typical adventure title with you controlling your character, interacting with townspeople, solving inventory styles of puzzles. The creativity of the world itself with the art style is one of the better aspects of The Inner World and many of the characters were endearing. Robert, the main character, came across as annoying and whining sometimes, but his charm grew on me as I made my way further through the story and there’s a lot of other great characters as well. Without spoiling the story, you play as Robert who looks different from the other citizens of the world. He has a flute nose in which there are holes in his nose and he can play music through it. He’s told at a young age that the world is evil and everyone will hate him for his differences, so he never really leaves the area that he’s confined to. But, one day he ends up going out and starts to meet new characters and sees that the world isn’t exactly what he thought it was. Graphically, The Inner World relies completely on hand-drawn art, which is not something you see often in modern games. Personally, I loved the hand-drawn graphics, because they resulted in beautiful visuals reminiscent of classic whimsical cartoons I grew up with and immersed me in the intriguing made-up world of Asposia. The variety of character and environmental designs was impressive and I oftentimes found myself taking a moment to enjoy the visuals before starting dialogue or solving puzzles. Pairing with the outstanding visuals are equally superb music and voice acting. All the dialogue is done with voice-overs and it greatly enhances character development and the storyline. The best example of this is with the main protagonist Robert, of whom I empathized with once I understood his motives. It’s also worth mentioning that the voice acting adds a lot of humor to The Inner World and keeps the proceedings light-hearted and fun. There are five different chapters, each with their own contained areas, though you do end up repeating a few areas in later chapters. All the items you’re going to need to interact with objects are all located within a few sets of screens per chapter. Your general goal is usually to find objects, combine them, and interact with characters and other items in order to get the story to progress. Many times it comes down to talking to a character, they tell you they need a certain object or are blocking a path you have to go, and you’ll need to either go get the said object or find something to distract them so you can get by. This sequence of events is very typical of adventure games and if you like or find the style of gameplay nostalgic you will most likely enjoy most of what The Inner World has to offer. My biggest issue came from using the interface itself and I wish they would have used more of a cursor-like approach for selecting interactive things instead of the shoulder buttons for cycling through these interactive spots. You can move your character around with the left stick which I thought was a nice inclusion, but never really solved the interaction options. When you select a certain interactive area you then select whether you want to look at it, talk to it, or use it depending upon if its a person or an object, and you may need to combine the interactive spot with another item from your inventory. This doesn’t sound too bad at first, but it becomes a clunky system rather quickly and even as I made it further into The Inner World I was still making mistakes and pressing the wrong buttons from time to time. It’s a shame because there are a lot of other great adventure titles on the Switch that ended up doing this type of gameplay system much more effectively. Overall, The Inner World is still a very fun adventure title if you like the genre. The artwork and character were unique and it told a funny story with some heartwarming moments sprinkled in. It’s not extremely long to get through, taking roughly two through three hours and this length can be attributed to the sequel, which is out now as well on the Switch eShop, The Inner World: The Last Wind Monk.